Disney Frozen Elsa and Anna 14 oz. Mug:"Only an act of true love will thaw a frozen heart." 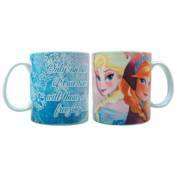 Whether you need to warm up or wake up, you'll love drinking from the Disney Frozen Elsa and Anna 14 oz. Mug! Features the memorable lesson from Disney'sFrozenon one side and an image of sisters Elsa and Anna on the reverse! Dishwasher and microwave safe. Ages 10 and up.